I have a green hair algae problem that is driving me crazy. The tests show the nitrates and phosphates are ok, but still I have algae. I read about the Vodka Method on RC. It is actually just that, adding Vodka to the tank to increase the population of probiotic bacteria to fight algae growth. Just curious if any club members have tried this. I am getting desparate! I added over a hundred snails to the tank last week andI did a water change to help get rid of the algae. I siphoned out all that I could. .I cut back the time that the halides are on by two hours. I have phos gard in the sump. I am going to try to get Wayne to put me together a de-nitrator. Any other suggestions? I vodka dose on and off. It is just adding vodka to the tank, somewhere on RC there is a chart on how much to start with and when to in crease and all that. It did seem to work I just got lazy with it and had a bacteria bloom so I stopped for now, probably start back up soon till I get a biopellet reactor. I am starting today. I am following Murray Camps method. Mix this (vodka and vinegar) and dose at0.1 ml per 20 gallons of water, daily. Every two weeks I am adding Prodibio Biodigest. Monitor phosphates and nitrates. When at zero, reduce dosage until you find your maintenance level. Also, the bacteria does not fight the algae. 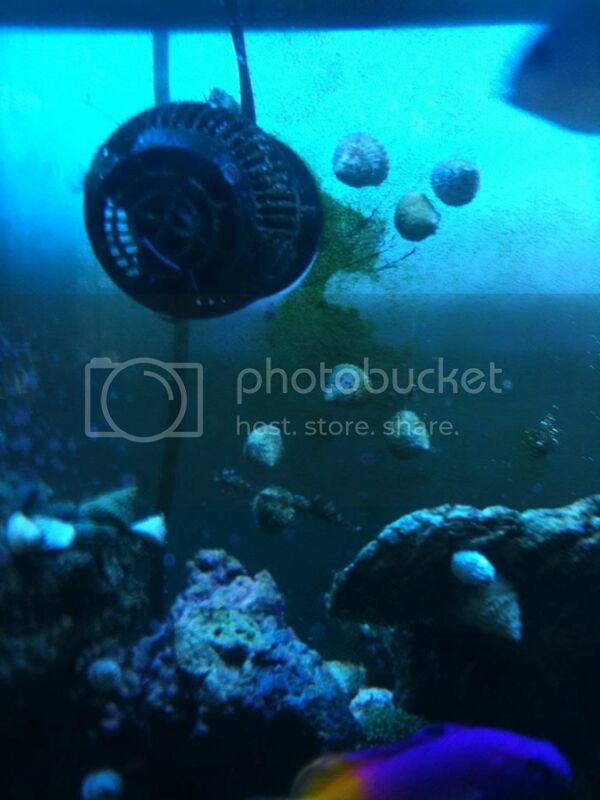 It consumes the nitrates and phosphates in the water and your skimmer then removes them. This is the food for the algae. So you are starving the algae. Jeff I'm going to try your way. I'll try to remember to post my results. I think I will try this way also. I"ll let you guys know.....wish me luck! Just remember to follow the chart mentioned by Jeff, he has a much larger setup than you do - and you will not need that much vodka and vinegar to start with! Does anyone have a link to the chart? I found it and here it is for anyone wanting to give it a try. It's number 6 in the article. For now, I'm skipping the glucose. I will be using Ascorbic acid in my mix...just as soon as I get some. Don't forget #8 of his article. This is the supplemental bacteria. And as far as dosing. At 0.1 ml/20 gallons, that works out to about 4 ml per day in my system. That's not even a shot! So Wayne, one bottle of vodka should last about a year for that size tank. ckeiling, the reason for dosing vodka is to eliminate nitrates and phosphates... but you said your levels were OK. If you already have no nitrates or phosphates in your water column, then vodka dosing or a denitrator won't accomplish much. Are you sure this is algae rather than cynobacteria (red or green slime algae) ? If this is cyno, your cleanup crew won't touch it, it's not real algae, it's a bacteria and you need to treat it via erythromycin or something like ChemiClean. What's your problem algae look like ? I tried this awhile ago without much success, but then again I also got lazy. I have read alot about it, and you do have to make sure you have a powerful skimmer to do this. I see two types, one is just green dust on the inside of the glass. The other is dark green and hairy, when you take it out of the water, it turns into something resembling dark green snot (sorry, but that's what it looks like). I will try to get a pic to post. The snails have eaten all of the hairy stuff that was on the back glass wall. So they do like it. But they have not moved onto the live rock to get if or onto the corals that have it. Clean off as much red slime as you easily can before treatment. Remove activated carbon, phosphate remover or other chemical media from filters and turn off protein skimmer (if you have one). Put 1 tablet Erythromycian (200mg) per 30 gallons in the tank. Wait 2 to 3 days and repeat the dosage. Wait another 3 days and repeat dosage again. Within three days of this last dose the Red Slime should be gone. Four days after the last dose you may replace your activated carbon and restart your filters. Turn your Protein Skimmer back on and set it at a very low setting. Note: If you turn your Protein Skimmer on too high it will quickly fill with foam. Gradually increase the setting back to a normal range over a number of days. 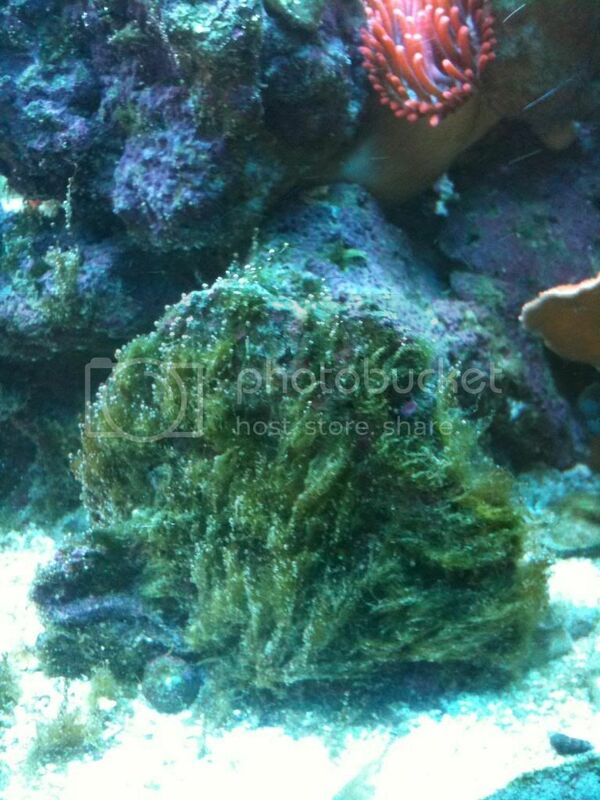 To prevent the return of Red Slime Algae we highly recommend that you run Chemi-Pure in the filter system. Would it hurt to try this even if the green moss turns out to be algae after all? Will this treatment stress out anything in the reef tank? If not, I will do it and see if it has an effect. If it were me I wouldn't use chemicals unless it was a last resort, I've used red slim remover before with no luck. Cyno uses nitrates and phosphates as well other nutrients and light. I had a bad cyno outbreak a couple of weeks ago and I just did a bunch of water changes and worked on lowering my levels of nitrates and phosphates and it worked good. Now I have stated carbon(vodka) dosing. p.s. In my opinion, if you have enough algae growing in the tank, it will use up the nitrates and phosphates showing good test results(like false zero readings). Had the same issue when I started my tank. Okay, I have pics of my problem. This rock is the worst in the tank. Totally covered. This pic shows that the snails have eaten most of it off the back wall, this being the last small patch. That doesn't look like cynobacteria to me...just hair algae. yep looks like hair to me.carol how old are your light bulbs? old bulbs will loose there spectrum leaning towards the spectrum that plants like.the only time i had it i tried everything with no results.when i learned about this i changed my old bulbs with new ones and the algae slowly went away on its own.now i like to change my bulbs every 10 months and have never had the problem since. Dave, I wrote to Sonjay Joshi about the 'old light' being an issue with algae blooms and he told me that really isn't true. The amount of spectrum shift is not significant to helping algae. There is always more than enough of the proper wavelength light for algae to grow, more of it doesn't make any difference. The only reason for changing bulbs is because they put out less light as they get older. He runs his MH's for 18-24 months by lowering them as the PAR goes down. I know that's not an option for most people. But even dim lights isn't a reason for algae growth. It's almost always phosphates and nitrates. If there is food, algae will grow no matter what kind of lights you have. If there is food, algae will grow no matter what kind of lights you have. FYI, Murray Camp (author of the article quoted) is on of our speakers in April. Tony Vargas was telling me he does the same thing with his MH lights (lowers them over the life of the bulb).